Recently, there has been considerable satisfaction and pride in official circles over the fact that the country has added to its green cover. Officials seem to believe that the rate of deforestation has been arrested. On the face of it, it certainly seems to be a matter of joy. But a deeper understanding of the situation is needed before we congratulate ourselves. In this context it is important to examine the difference between increase in tree cover and improvement in the quality of forests. But they cannot replace natural forests—especially their biodiversity. Natural forests in sound health provide ecosystem services to a region. Improving the quality of natural forests is far more complex than increasing tree density. For example, replacing moist evergreen forests of the Northeast and the Western Ghats with fast growing eucalyptus, poplar, or even palm oil plantations, can increase tree cover. But that might alter the ecology of the region and degrade biodiversity. Biodiversity is not a mere assemblage of a number of genera and species. It is location-specific and provides a template for essential ecosystem functions like stream flow, nutrient recycling, pollination mechanism, fertilizing mechanism and micro-climate. In any ecoysystem there are interactions among species and their physical and chemical environment; there is always interdependence between different living organisms. There is also competition for space, nutrients and reproduction. Many small species die and others are born. Ecologist D W Schindler once wrote, “Destabilizing forces are important in maintaining productivity and biogeochemical cycles and even when these features are perturbed, they recover rather rapidly.” Plantations hamper such interaction. Some ecological services derive from the structure and terrain of an eco-zone, others are not directly dependant on structure. For example, while water supply, soil formation, food production, raw materials, forest recreation and cultural importance derive from a particular structure of the ecosystem, carbon dioxide sequestration and climate regulation do not depend on the structure of an eco-zone. The tree cover in the country has indeed increased but the quality of dense forests or even moderately dense forests is declining in almost every state. The recently published Forest Survey of India reports note as much. All this must also be seen in light of the fact that Indian forests account for 2 per cent of the world’s forests. This 2 per cent area supports 17 per cent of the world’s population. This is one of the lowest per capita forests area in the world. The legal area under forests does not guarantee you the required ecological stability and ecosystem service unless the health of the natural forests is in sound condition. 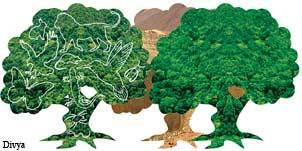 Forest administrators often harp that 33 per cent of the country’s geographical area should have tree cover. The figure is mentioned at almost every forum, including among decision makers. It will certainly be very good to have a high tree cover but grasping the ecological service of the forests and trees are of much more value than providing forest produce for commercial purposes. Of course, forest produce is important in a country where a large number of people live below the poverty line and are directly or indirectly dependent on natural resources. But it is seldom realized that forest produce can be transferred from one part of the country to another, not ecological resources.